Meter Marine Labels are an innovative Synthetic Label Stock that is Waterproof, Tear Proof & Oil Resistant that have been specifically designed for use in Laser Printers and Digital Copiers. 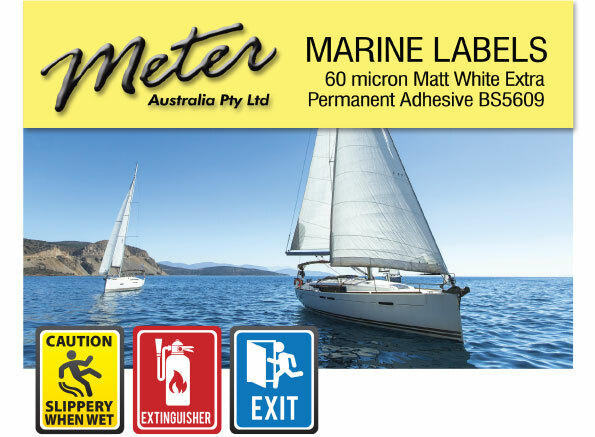 Marine Grade Labels are Matt White and have Extra Permanent Adhesive that is BS5609 compliant. These Durable Synthetic Labels are made from Polyester, which means they are tough and designed to last. Marine Grade BS5609 compliant permanent adhesive. Bright white matt finish, ideal for labels in full colour. Tear resistant waterproof face film stays flat. Ideal for chemical and container labelling. Heavy weight stabilised paper liner, suitable for long print runs from low production – to medium-speed printers. Saltwater Proof, Petrol Proof, Oil Proof, Tear Proof, UV Resistant and suitable for submerging in Sea Water. Meter BS5609 Marine Labels are suitable for most Copiers and Laser Printers (both mono and colour machines)-small Volume, mid-volume & production machines. On such machines the user must establish for themselves the suitability &/or the optimum settings and paper path, being aware of the thickness and weight of the material. Please call or email us to ask for friendly advice.